Teething is not an easy time for mother or baby and if we could ease the pain for both parties, why wouldn’t we? Exactly why our Baby Biltong is perfect for teething. When your little one’s teeth first start pushing out, it causes discomfort. This could happen anywhere between 4 – 12 months but commonly occurs at 6 months. Usually, you’re able to tell by baby’s sore or red gums or one flushed cheek; although the most common sign is a whole lot of drooling. Baby can also become quite irritable and with good reason, we think. Chewing at those (very cute) little fingers are normally a sign that baby’s teeth are getting ready to surface. Giving them something to chew on will offer some relief and a lot of parents turn to something like carrots or apples. While they’re perfect, you wouldn’t really want anything that could be considered a choking hazard. On the other hands, you also don’t want your little one to chew on something sugary like a rusk, as it could lead to tooth decay. This makes our pieces of baby biltong the perfect tong for the job. Not only is it low in salt and mildly seasoned, but it comes in a size that’s easy to hold, yet not small enough to choke on. You’re looking at something that’s around half an average piece of biltong or about four pencil sticks put together. Regardless, always remember to always keen an eye on your littlun. That’s it. 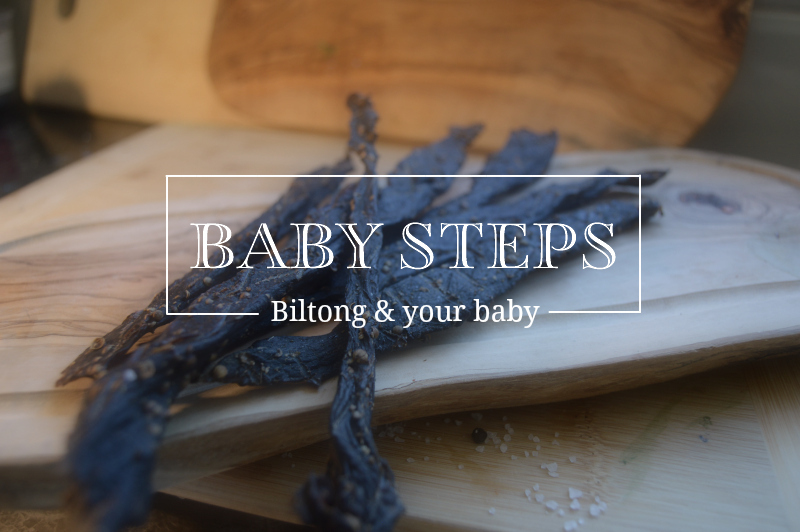 Our Baby Biltong is perfect for teething, wouldn’t you agree? To shop, purchase our Award-Winning Original Beef Biltong here and add ‘Baby Biltong’ to the comment box at checkout. Feel free to send us pictures of the little #BiltongPeople, chewing on Baby Biltong, via Social Media here.